I am going to declare my first Three Sisters Garden an unmitigated success. Of course when you create a new garden by dumping two compost bins full of black gold in a sunny spot you are likely to be successful – even in a poor gardening year. 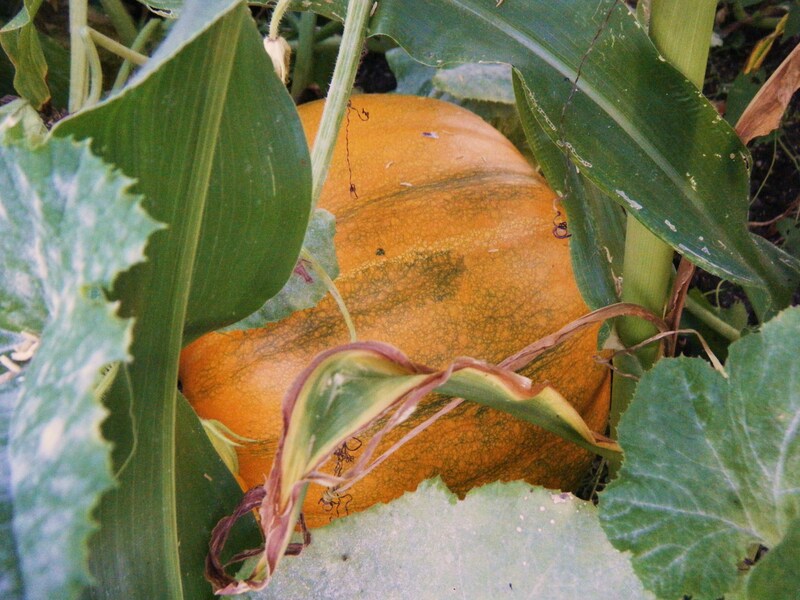 I’ve been enjoying beans for a while now, harvesting corn for the last couple weeks, and the pumpkins are just beginning to turn orange. The vigour with which these plants have grown (in pure compost) is just amazing; everything grew lush, dark green and HUGE!!! I swear the corn is 10 feet tall! One unexpected bonus was the extra production of corn cobs on these gargantuan plants. 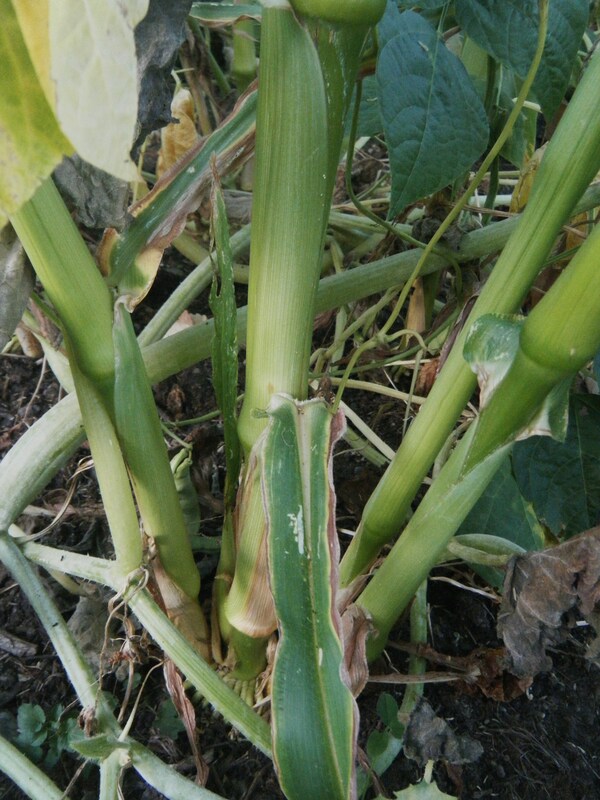 Each cornstalk has sprouted two or three suckers or “tillers” as they’re sometimes called. 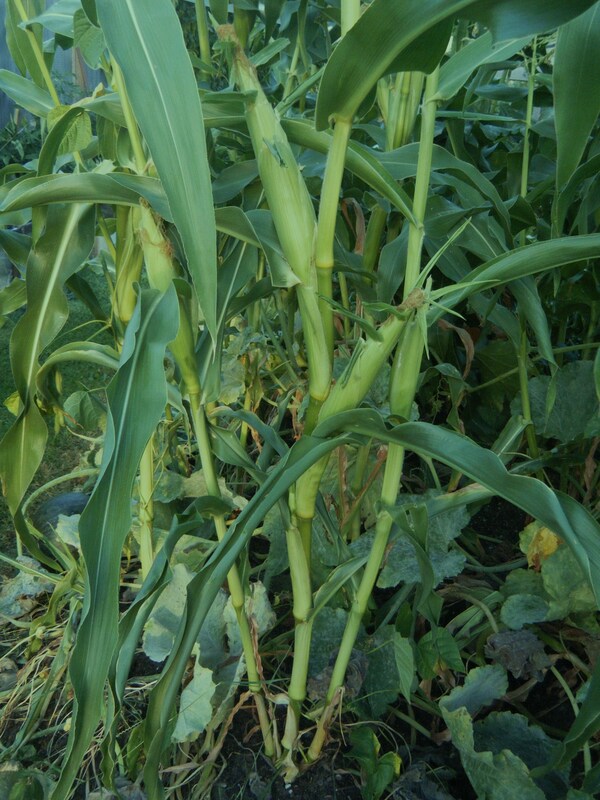 This isn’t all that unusual; corn plants have been known to produce these side shoots when given enough space and grown in fertile soil. 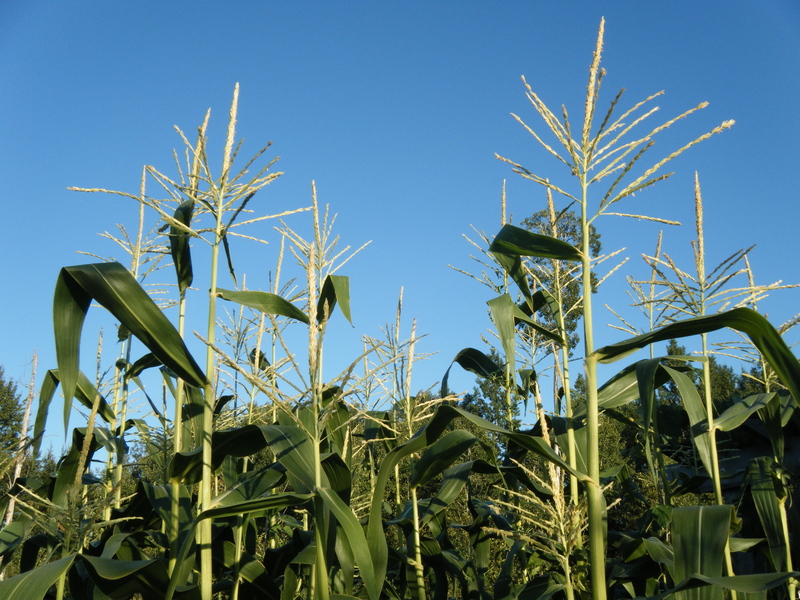 But what I’ve never seen before is tillers that have grown almost as tall as the main cornstalks, producing full-sized ears of corn. 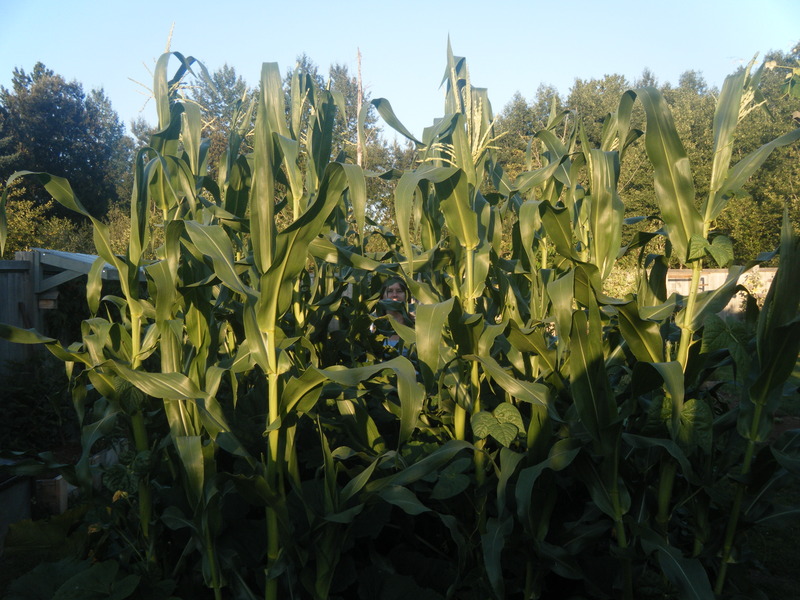 Quite a few of the plants have grown 4 or 5 big ears of corn, along with several small ones that probably won’t be worth eating. Although I haven’t picked any little ones yet, these guys will likely have scarce kernel development. Not that I’m complaining, We’re enjoying an excellent harvest of Jubilee corn, and my new favourite way to flavour it after boiling or barbecuing the cobs is with melted butter, salt and freshly ground black pepper, and a generous squeeze of fresh lime juice – YUM! Harvesting my Three Sisters Garden has been very rewarding, and confirms my faith in the power of compost. If you are one of those who doesn’t compost because you’re afraid of attracting rats (if you think you don’t have rats in your yard, you’re probably deluding yourself), or because it’s too much work (it’s really not much work, and if you’re gathering up your green waste for someone else to take away and benefit from it’s YOUR loss) please reconsider. Don’t waste your green waste – it can power your garden and fill your plate. I'm dwarfed by the corn and it hadn't even reached its ultimate height. BTW - I'm 5'5"
This entry was posted in Autumn, Vegetables and tagged BC garden blog, beans, Compost, Corn, Harvest, Pumpkin, three sisters garden, Vancouver Island garden blog. Bookmark the permalink.